For the FBX asset to be imported, the FbxImporter plugin must be loaded. To simplify sequential import of multiple similar assets Asset Browser remembers previous asset import settings and offers to use them by default. To reset import settings to system defaults use the Restore Defaults button. Imports FBX with mesh instances. When enabled, a single mesh is imported instead of several identical ones. If you add such FBX to the scene, all meshes in the World Hierarchy will refer to the single mesh stored inside the imported FBX container. Merges all of the children static meshes into a single one (named after the parent mesh). All surfaces of all meshes surfaces will be copied and shown in the Surfaces hierarchy. Enables splitting of imported meshes. Too large models having sizes, that exceed 10000 units may have various artefacts (jitter, etc.) associated with positioning errors. You can eliminate such artefacts by splitting your mesh into multiple separate meshes. To do so, just enable this option and set the size of the grid cell (see the Grid Size parameter below) to be used for mesh splitting. This option does not split surfaces. Size of the grid cell to split imported meshes, in units. Places a pivot of generated mesh to its center. Can be used for meshes having their geometry located too far from their pivot, as this may lead to various artefacts (jitter, etc.) associated with positioning errors. Enables correct triangulation of meshes, NURBS and patches. Disabling this option decreases import time, but may lead to triangulation errors resulting in incorrect geometry. Take From Assets - use existing materials (if any). Overwrite Assets - overwrite existing materials (if any). 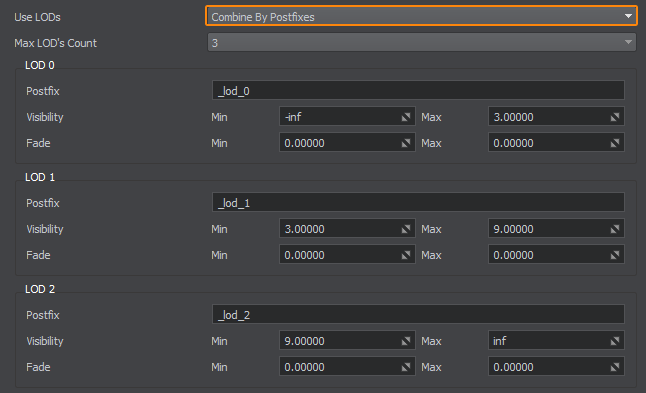 Enables to add a prefix for imported materials to avoid collision of names. 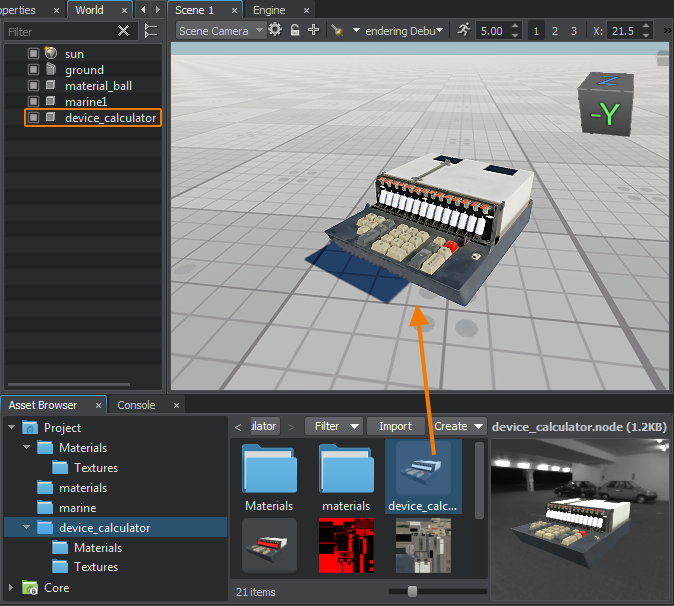 Enables to merge materials with the same settings, but different names. Enables importing animation skeletons without a skin from the file. If you have an FBX file containing skeletal animation without any geometry, you can import it to your UNIGINE project and use generated .anim files. Enables changing orientation of bones for animations and animated geometry. When enabled, all bones will have the same forward axis as the geometry. This simplifies work with animations via code for programmers reducing excessive axis manipulations: if a mesh has +Y as a forward axis, the bones will have +Y as well. 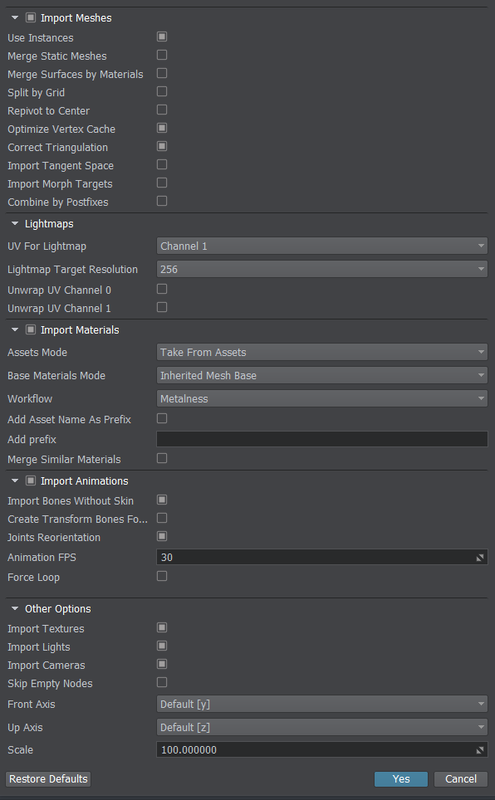 Imports the hierarchy of the joints (bones) for animated FBX assets as a list of World Transform Bones. If this option is disabled, imported animations for a mesh will still work. Enables skipping empty nodes. Complex CAD models may contain a lot of empty nodes, resulting in an overloaded world hierarchy. You can enable this option to simplify generated hierarchy by ignoring nodes, that do not contain any useful information. If you have an FBX file containing skeletal animation without any geometry, you can import it to your UNIGINE project via the Import Bones Without Skin and use generated .anim files.